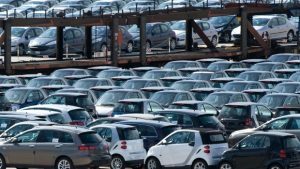 The new car market across the European Union was flat during October as demand dropped in the two largest countries of the bloc reported the Automobile Manufacturers Association or ACEA on Thursday. Total sales in the EU slightly exceeded 1.1 million, showed a statement released by the trade group that is based in Brussels, Belgium. That figure represented a slight drop of 0.02% in comparison to sales during October of 2015. In Germany, which is the largest car market in all of the EU, sales were down by over 5.6% finishing the month of October at 262,725 units. At the same time, France, which is the union’s third biggest market saw its vehicles sales drop by over 4% to end October with 155,195 units sold. In other large nations within the European Union, sales stayed buoyant, as year on year increases were seen in Britain, Italy and Spain. Britain increased the least at 1.4%, while Spain saw an increase of 4% and Italy jumped by 9.7%. Thus far from the start of 2016 through the end of October, 12.35 million vehicles have been sold, which represents an increase of 7.2% in comparison to the same period during 2015. Those increases were driven by growth in the market above 10% in Spain and Italy and results that were more subdued for Britain, France and Germany. The Volkswagen Group, based in Germany, remained the market leader in the EU during the first 10 full months of 2016 although with a drop in share from 24.9% to 23.9%. France’s PSA was second, while third was held down by Renault another French carmaker. PSA had a market share of 10%, while Renault’s market share just fell short of 10% at 9.9%. Ford held the fourth largest market share at 7.1% followed closely by Opel Group, which held 6.8% of the total. Fiat-Chrysler and BMW were at 6.7% while Daimler, the maker of Mercedes, sat at 6.2%. New car sales have become one of the closely followed indicators for the health of the economy. Across the European Union, vehicle sales dramatically dropped following the global financial crisis of 2008, but were steadily rising since September of 2013 until there was a slight hiccup during July followed by this flat reading for October. Boeing Co Shares Sold by Eagle Asset Management Inc.